'Over past month, we've been in this village working nonstop to thwart terror,' says IDF officer after terrorist's home demolished. Israeli security forces demolished the home of an Arab terrorist in the village of Kobar overnight, an operation that IDF Lt. Col. Liron Appleman says is just the latest in a string of anti-terror activities in the Palestinian Authority-controlled town. The home had belonged to Muhammad Tareq Ibrahim Dar Yusuf, who murdered 31-year-old Yotam Ovadia in the town of Adam on July 26th. Shortly after the fatal stabbing attack, the terrorist was shot and killed. 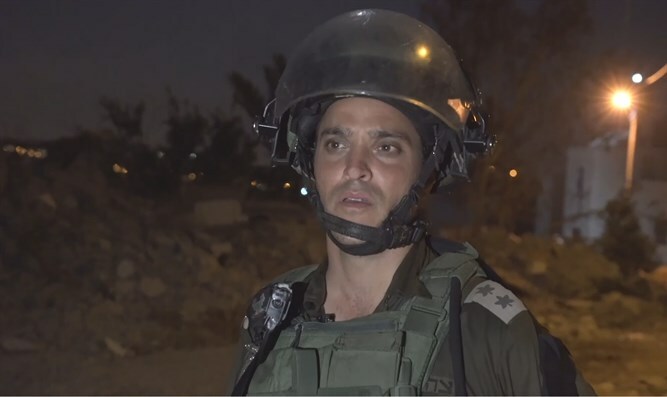 As part of Israel’s anti-terror deterrent policy, Israel demolished Yusuf’s home, Liron Appleman said late Monday night, adding that the operation was just the latest effort by Israeli security forces to combat terror in Kobar. The town, he noted, has been a breeding ground for terrorism, and several terrorists involved in recent attacks hail from Kobar. Kobar is also the home of arch-terrorist Marwan Barghouti, currently serving five life sentences for his role in orchestrating a series of terror attacks during the Second Intifada.